Anyone delving into the meat of this website knows I have extensive experience hiking the Wonderland Trail....30 times at least. In the past decade I started exploring areas of Rainier off trail, and have written about a circumnavigation hitting these highlights that I have termed the Mount Rainier Grand Tour. With terabytes of video and photos, I have everything I need to begin showcasing this incredible park, and will present this collection on these pages. I have already time lapsed every foot of the Wonderland, including the alternate route over Spray Park. I have documented every notable bike route and (bike) climb around the mountain, including the Ipsut Creek trail, the West Side Road, Longmire to Paradise, Sunset Park Road, highway 410, SR 123 and Stevens Canyon road. I have even documented skiing the Inter Glacier. But to really experience Mt. Rainier National Park, you have to leave the Wonderland and explore off trail. The Grand Tour involves 150 miles of foot travel and 50,000 feet of climb and descent, the price one pays to forge higher up the cleavers and divides to view the mountain up close, to look down on seracs and glaciers, to gaze on incredible vistas far from the beaten path. One needs the experience, stamina and LNT ethics to visit these places. In this framework I will present general information without hand holding like detailed maps and .gpx files. Even if you have no desire to get off trail, here you will be able to vicariously see and experience these incredible areas. All music is realized by and produced at the Willis Wall Studios with appropriate copyrights. Also, detailed accounts of these segments can be found in the Willis Wall blog if one wants to delve deeper and see more photos. Go to the bottom of this page for the official route description. Each segment requires some background music, which I have made available individually after each segment. Total viewing time for these videos I through VI is 1 hour 50 minutes. In preparing for this project I have been contemplating how to represent this journey for orientation. Although I use Google Earth and two dimensional maps, the thought struck me to photograph the topographic model that resides in the Longmire Ranger Station. On a trip in December, I talked the very nice and cooperative rangers there to open up so I could take a series of photos, as this building is closed to the public in the winter months. In experimenting with this orientation concept I believe I can provide a unique view of the Grand Tour with overlays on this 3 dimensional one of a kind model. DISCLAIMER: Off trail travel requires a skill level beyond basic trail backpacking. Activities represented in this series can be dangerous, especially glacier travel like on the Inter. Mountain weather can change quickly for the worse; people have perished on the Muir snowfield after getting caught in bad weather. Also, the off trail areas I present in the Grand Tour are fragile and anyone visiting them should have thoroughly mastered LNT practices, especially areas like the Elysian Fields. I suggest that in visiting these regions one should camp lower in established sites and venture off trail during the day, descending back for the overnights. If you found this site please enjoy this series, a lot of work goes into each one. The first segment produced is Mt. Ruth/Steamboat Prow, filmed in June/July 2014 and September 2015. Mt. Ruth (8690') can be accessed via cross country, paralleling the White River on the left and gaining the ridge that leads to the summit and on to Steamboat Prow (9705'). The route then descends a climbers trail to Glacier Basin, positioning one to continue on to 3rd Burroughs and the Elysian Fields segment (CCW) or Goat Island Mountain/Banshee (CW). With the usual warnings and cautions about unroped glacier travel noted in the video, this supplement to the Mt. 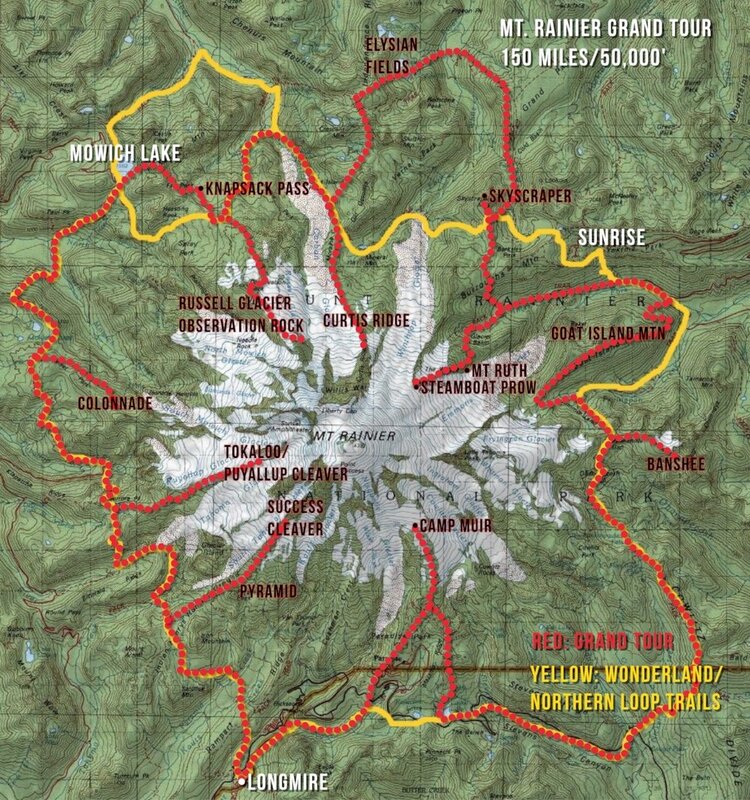 Rainier Grand Tour Series takes the viewer on two trips up the Glacier Basin trail and the Inter Glacier to the top of Steamboat Prow (9700'); a skin/ski trip on May 29, 2017, and footage from a hike one month later with my daughter. This trip entails 12 miles RT with 5200' elevation and allows the viewer to vicariously experience snippets of what can be encountered on this trip (in good weather). Keeping to the North East side of the Park, this segment covers the wide expansive views from Goat Island Mountain (7288'), then continues on through Summerland, departing the Wonderland at Panhandle Gap (6755') and ascending the gentle meadowed slopes to Banshee Peak (7400'). These videos were captured in August 2014 and July 2015. The next two videos are the segment covering the Burroughs Mountains to the Elysian Fields (via the Northern Loop Trail), transiting to Moraine Park and intercepting the Wonderland below Mystic Pass. This first video supplements the segment by showing a time lapse of the off trail portion from Windy Gap to Crescent Gap, where one can access the interior encompassing the Elysian Fields, Vernal Park and Moraine Park. If exiting via Moraine Park, one is positioned to explore Curtis Ridge. These videos were captured in August 2010 and 2015. Part IV of the Mount Rainier Grand Tour picks up on the Wonderland Trail after exiting the Elysian Fields and proceeds a short distance to Mystic Pass. From Mystic Pass an obvious climbers trail will eventually deposit the hiker on Curtis Ridge, which offers miles of aimless wanderings all the way above 9,000 feet if one accesses the snow field to skirt some steeper terrain. Overlooking the Willis Wall, Liberty Ridge and the birth place of the Carbon River, one can turn 180 degrees and look back towards Old Desolate and Mystic Lake. And right across the glacier are the next areas to explore; Observation Rock, Ptarmigan Ridge and the Russell Glacier. This section of the Grand Tour encompasses some of the most astounding views one can get in the park! These videos were captured in October 2014, September 2016 and July 2017. After arriving at Mowich Lake, either by the Spray Park trail or over Knapsack Pass, continue on CCW to Golden Lakes. About 1.5 miles past the Lakes, gain the unmaintained access trail in Sunset Park that will now take us up the mostly open ridge (through an old burn area) to The Colonnade. There are remnants of an old lookout here, and my bivy spot at 6700' allowed for wide open views and a front row seat for the sunset alpenglow on the mountain. Retracing steps back to Sunset Park and the Wonderland, continue CCW past Klapatche Park camp to St. Andrews Lake. The trek up to Tokaloo Rock entails more difficult cross country travel, especially on the broken rock past Tokaloo Spire and up, left side, to Tokaloo Rock (7684'). Reversing course back to St. Andrews Lake and the Wonderland, CCW travel continues to Part VI and the final segment of the Grand Tour, Pyramid Peak, the Success Divide, and the 7500' climb from Longmire to Camp Muir (10,188'); however, these western points of the Grand Tour can be accessed via the West Side Road. There is a trail that connects the West Side Road to the South Puyallup camp, and this segment ends with scenes from this camp. The Colonnade footage was recorded in September 2016 and Tokaloo footage was captured in September of 2014. Yes, this project has been in progress for a few years! Enjoy this segment, Part V of the Mt. Rainier Grand Tour: Colonnade/Tokaloo. Part VI, the final leg of the Mt. Rainier Grand tour, picks up on the Wonderland at St. Andrews Lake and proceeds to Indian Henry's Hunting Ground, where we take a quick tour of the ranger cabin and then head towards Pyramid Peak on the Mirror Lakes trail. Enjoy the wide open vistas from the broad summit plateau of Pyramid Peak (6937') before descending to the base and gaining Success Divide and Success Cleaver for intimate views of the South Tahoma Glacier, up to an altitude of 8300'. This difficult cross country hike on rock and scree is captured in lingering intimacy; there is no rush on this segment, and that includes the final point on the Tour, Camp Muir at 10,188'. Enjoy scenes from the snowfield and Camp Muir as the entire climb plays in an inset (time lapse, 3 hours condensed to 3 minutes). Capping off with a few scenes from the Skyline trail connecting to the Wonderland, the Tour comes full circle if one continues on to Panhandle Gap (Banshee). I hope viewers have enjoyed these looks into some of the off trail, spectacular portions of Mt. Rainier National Park. Thanks for watching and Happy Hiking!